It sounds like a tale you can’t make up if you tried; Our dog got loose from the pet sitter we hired from Rover, and ran four miles through the coyote and rattlesnake filled hills of Encinitas, California, before falling in a canal and floating down the swiftly moving waters of the San Elijo Lagoon for miles. If anything in this day and age of 2018 sounds like fake new, it is definitely this tall tale. We had planned out our Thanksgiving weekend getaway weeks in advance. Saturday we would spend at Del Mar Thoroughbred Club betting on the ponies in the owner’s lounge. And maybe enjoy a cocktail or two between wagers. After the races, we were going to walk to the free Easton Corbit country concert at Del Mar. 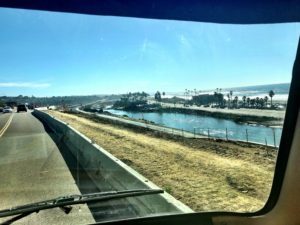 We unexpectedly were able to book a last minute spot for our 32 foot RV at the RV park that sits literally across the parking lot from the race track, when a popular jockey who usually camps here decided not to ride at Del Mar for this meet. With Santiago’s spot vacant, we booked our campsite and before you could say, Thanksgiving dinner, we had our entire trip planned out. The only issue was, we had to take our pup, Carly with us. This is not usually an issue; Carly camps with us and has traveled all over the west coast with us. 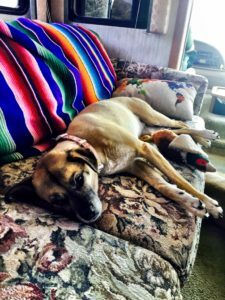 She loves camping, hiking and RV life but leaving this furry ball of energy alone inside Stormy the Fleetwood RV all day sounded like a recipe for disaster. I had never used apps like Wags or Rover before but they made it seem easy to book a professional pet sitter with great reviews. 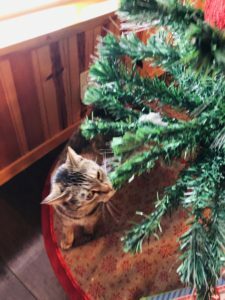 A few clicks of my iPhone later and we had found a fantastic local pet sitter with great five star reviews. Del Mar here we come! Our day at the races looked to be off to a great start as we gambled on the ponies and yelled mostly encouraging words at our favorite jockeys. Our friend who owns horses with syndicate group BlinkersOn got us a great table in the Horseman’s Lounge and by the fifth race, we were having an excellent Saturday afternoon at Del Mar. Our table was outside on the terrace overlooking the flower-filled paddock and gave us a great view of every thoroughbred racehorse as they were saddled up and lead out to historic Del Mar to run. What a fun and relaxing way to spend a Saturday afternoon in San Diego. Our day at Del Mar Thoroughbred Club was looking fabulous! Then our dog sitter thought it would be a safe idea to walk a dog he had literally just met off leash in a metropolis city like Encinitas. I truly do not know what he was thinking. It’s not surprising that our dog took off when given the chance and raced off into the hills of San Diego. This would be the photo that I would plaster all over social media when Carly went missing. As of early afternoon in Del Mar, California, we had been gambling away a few dollars at Del Mar Race Track, betting exactas and trifectas and maybe take a selfie with Bob Baffert. We had no idea our pup was galavanting through the San Diego hills until my iPhone rang out of the blue. I had a voicemail from the pet sitter flash up on the screen of my iPhone. Carly was gone. She had escaped from the pet sitter and she was loose somewhere in the rolling hills of San Diego County. The evening before Carly decided to head for the hills. I was instantly in a full panic and forgot all about handicapping the ponies for the sixth race and called the local Rancho Coastal Animal Rescue. I loved that the call actually went through to a live person and not to a switchboard, where you had to push one, then two then God knows what in order to get connected to a live person. I may have gotten through quickly to an employee but the bad news was, our missing pet had not been turned in yet. We listed Carly as missing on Nextdoor.com and every Facebook group between Orange County and the Mexican border and jumped in the car. Leaving the ponies and dreams of hitting the Pick Six behind, and made a beeline for the pet sitters neighborhood. Once we pulled over and jumped out of the car, whistling and screaming Carly’s name as loud as we possibly could I felt the situation getting very dire. It was a very nice neighborhood but off of El Camino Real with tons of traffic driving extremely fast towards the Christmas tree lot and the five freeway. Carly is a kumbaya mountain mutt. She’s used to the mountain trails of Big Bear Lake and chasing deer and squirrels. Cars and trucks driving by at forty miles an hour must be terrifying to this little brown rescue dog! We sprinted up and down the side streets looking for our furry friend and the sun was dipping behind the hills quickly. My heart was racing; There were surely coyotes in those hills and if we didn’t find her before sunset I had a bad, bad feeling, we would never get our dog back. I was feeling depressed and desperate and had to call the shelter back just before five p.m. when they closed for the day. I couldn’t believe my luck when the shelter employee said “A man just walked in with a brown dog with a pink collar, let me check the microchip number” I felt like it was a miracle when the microchip number matched up! Our fur baby had been found! 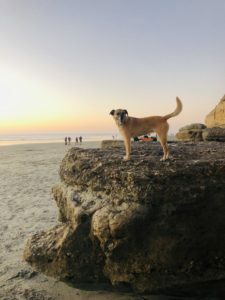 I felt like Chase, the amazing dog rescuer had to be pulling my leg when he told me on the phone “She was drowning in the Pacific Ocean and we swam in and saved her” How on earth did this little brown Pug-Beagle mix get miles away from where she first went missing and manage to almost swim out to sea? 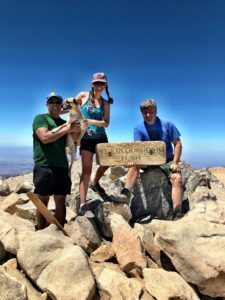 Carly is a very high energy dog and had hiked multiple times to the top of San Gorgonio with me, the highest peak in Southern California, but I just couldn’t see how it was possible that she made it all the way to the ocean! Chase drove her back to us and we were dying to hear the whole story (And also give our pup a hug) Chase had been about to order a beer at the Kraken in Cardiff when he looked up from the pool tables in the back and saw a little brown dog floating down San Elijo Lagoon, and barely keeping afloat in the murky canal. Carly was drowning. 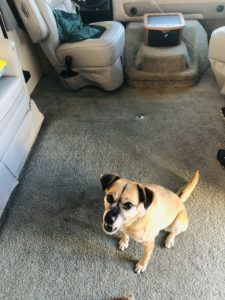 She had floated down the canal for miles to end up here, at the confluence of the Pacific Ocean and it took two hero’s from The Kraken to jump into the chilly November water and save our pup. We are so thankful that two these dudes were drinking beers at a biker bar in Cardiff-By-The-Sea and between rounds of playing pool, they glanced up and saw Carly drowning. Then they left their beers and pool cues and jumped into the chilly waters of the lagoon to save our favorite four-legged hiking buddy from drowning out at sea. When you save a dog from drowning, you get licked a lot. View of the lagoon Carly was drowning in, as well as the Kraken Bar. 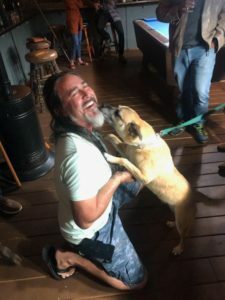 Right around the time Easton Corbit should have been taking the stage at Del Mar Thoroughbred Club, we were reuniting with a slightly wet, very stinky little dog we know in Cardiff-By-The-Sea. And possibly buying some rounds for some awesome unbelievable heroes in a dive bar in Cardiff. 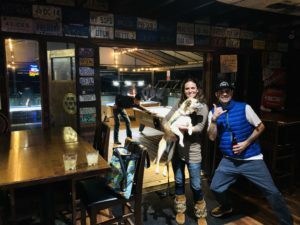 Because when you selflessly jump in the ocean in late November to save a little dog’s life, I think you deserve a few beers.